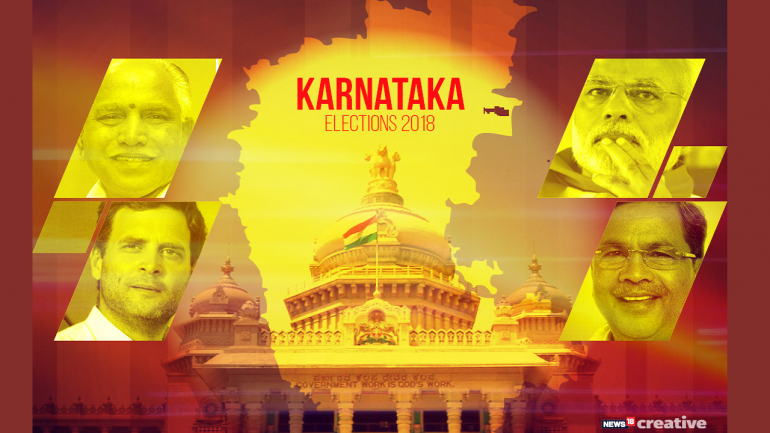 Latest updates from the Karnataka as the state awaits result of the Assembly election held on May 12. Exit polls have predicted a hung House, most showing BJP having a lead. Several incidents of cash-for-votes are being reported from across the state. Congress and BJP are pointing fingers at each other. Voter turnout stands at 37% till 1.00 pm. 24% voter turnout recorded till 11.00 am. Voter turnout 10.6% till 9.00 am. Faulty VVPAT machine being replaced a booth in Hubli. Voting yet to resume at the booth. Voting in the Karnataka Assembly election has officially begun. Total of Rs 170.88 crore has been seized till now. Rahul Gandhi reacts to BJP’s 'Italian' dig at Sonia Gandhi, says, "My mother is more Indian than many." The election campaign will end today at 5:00 pm, according to the Election Commission guidelines. 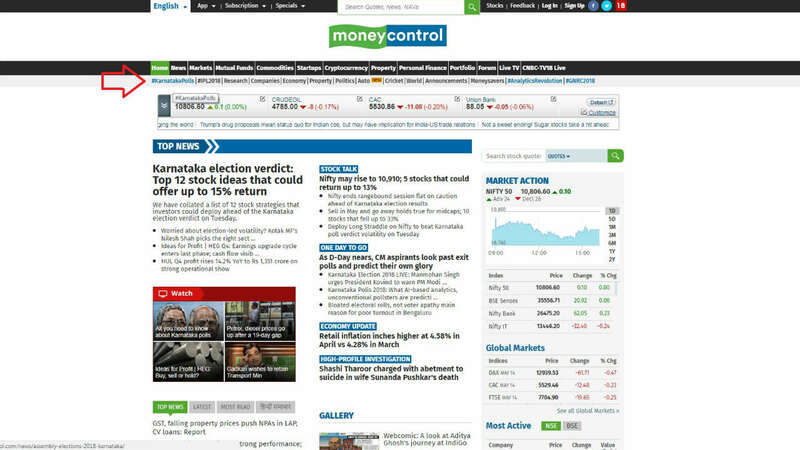 The economy of the country is progressing. 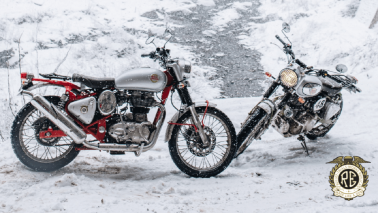 2.5 crore vehicles(2-wheelers, 3-wheelers and 4-wheelers, farm vehicles) have been sold and 40lakh have been exported. The industry has made so much progress that Japan is buying vehicles from India. Karnataka needs a receptive government to reap the benefits that the entire nation is getting. Karnataka needs a BJP government. BJP is a grounded party which strives to work for the interests of the common man. We do not indulge in mahakaavyas, we make promises and fulfill them. Our manifesto is in the form of a set of promises-- to end corruption, to provide sufficient water for irrigation, for getting higher price for crop produce, for skilled development and for employment. We have made a promise to provide a conducive environment for entrepreneurship. We have made a promise to provide safety to the women of Bengaluru. And in the first meeting that the party addresses after ovrthrowing the Siddaramaiah government, the roadmap for these promises will be prepared. Narendra Modi addresses a public meeting in Bengaluru. Congress is indulging in caste politics because they don't have any development agenda: Amit Shah to News18. BJP alleges that Siddaramaiah has links with a Ponzi scheme, News18 reports. Amit Shah conducts roadshow in Belgaum. The PM is on stage with BJP state unit chief and CM candidate BS Yeddyurappa in Santemarahalli, Chamrajnagar. Modi will be addressing more than a 12 rallies over 5 days in the poll-bound state. PM Narendra Modi tweets about his tour of Karnataka, where he will address rallies in Santhemarahalli, Udupi and Chikkodi on Tuesday. Prime Minister Narendra Modi will address his first rally in Karnataka today in the southern part of the state, where the BJP has traditionally finished third behind Congress and the JD(S). Modi will be hoping to turn around the fortunes of his party in the area. 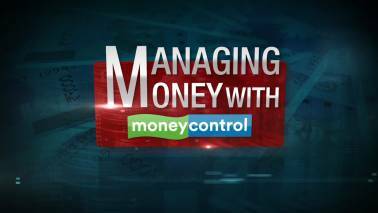 Moneycontrol News With counting for Karnataka assembly elections scheduled to begin at 8am tomorrow, here's how you can check constituency-wise results on Moneycontrol. The Centre for Media Studies, which describes itself as a not-for-profit, multi-disciplinary development research and facilitative think-tank on its website, has described the electoral exercise as "money guzzler". 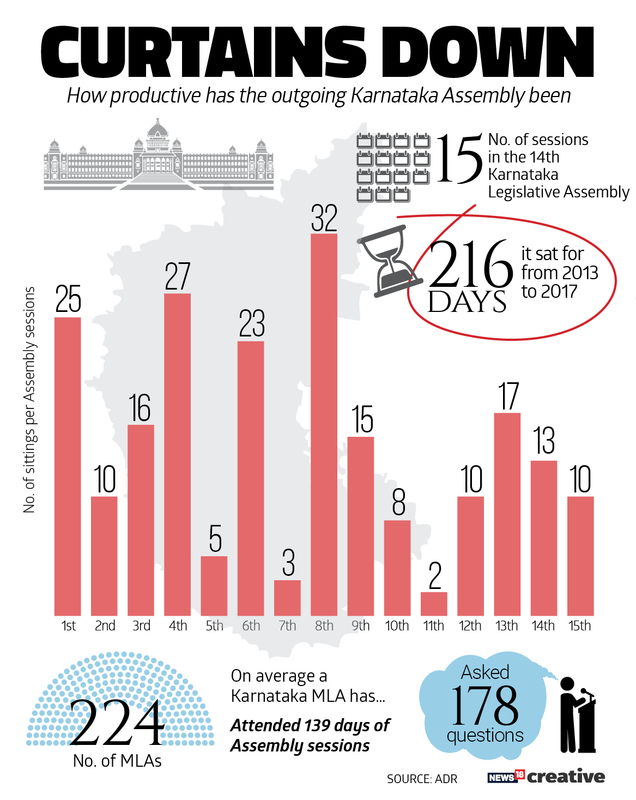 According to the CMS, the money spent by various political parties and their candidates in the Karnataka assembly polls is in the range of Rs 9,500-10,500 crore, which is more than twice of what was spent in the previous assembly poll in the state in 2013.
ranging from a minimum of 20 paise to a maximum of 60 paise. Announcing the increase effective from April 1 last, the Karnataka Electricity Regulatory Commission said the increase for domestic consumers would be 25 paise per unit in areas covered by the Bangalore Electricity Supply Company Limited (BESCOM). For areas outside the BESCOM limits where the consumption was between 0 to 30 KWH, the hike would be 20 paise per unit, it said. KERC chairperson M K Shankarlinge Gowda said various electricity supply companies (ESCOMs) -- there are five in the state -- had sought a differential tariff hike ranging between 82 paise to 162 paise per unit. "As a uniform tariff is in vogue hitherto in the state, the commission has approved uniform increase across all ESCOMs with a marginal differential increase in BESCOM area," he told reporters. What the Karnataka Assembly could look like according to the exit poll results aired by different television channels. Why is sharing Cauvery waters a talking point in the Karnataka election debate? On February 16 this year, about a billion people expectantly eyed the Supreme Court, hoping that a just verdict will be pronounced on an issue that has prolonged for about a century now. Chief Ministerial candidates from the contesting parties, the Congress, JD(S) and the BJP, have rubbished exit polls and have expressed confidence in their own victory. Meanwhile, the repoll at three polling stations in the state are underway. Two of these stations are in Kushtagi constituency, Koppal while there is one in Hebbal, Bengaluru. The repoll will end at 6.00 pm today. Repolling in Hebbal’s Lottegollahalli polling station was necessitated after the EVM developed a snag. The Kushtagi repoll was necessitated due to a procedural error. As many as 275 voters were shifted from the booth number 20 to 21, however, their names remained on booth number 20’s list. Hence, repolling is being held in both booths. Congress leaders, including former Prime Minister Manmohan Singh have written to President Ram Nath Kovind objecting Prime Minister Narendra Modi’s public address during the Karnataka Assembly election campaign. Singh has said that the words used by PM Modi during his speech in Hubli, Karnataka are threatening. Singh has asked President Kovind to caution PM Modi from using ‘threatening and intimidating language’ against the leaders of the Congress Party or any other party of person as it does not behove position of the prime minister. The letter was also signed by Leader of Opposition in the Rajya Sabha Ghulam Nabi Azad, Leader of the Congress Parliamentary Party M Mallikarjun Kharge and other senior Congress leaders. The letter also pointed out the negation of Constitutional oath taken by PM Modi. “The President of India as the constitutional head of the union of India enjoys high duty and obligation to advise and guide the Prime Minister and his cabinet,” the letter added. BJP's CM candidate BS Yeddyurappa on Sunday said that he will ‘give it in writing’ that the saffron party would win the Assembly elections with an absolute majority and get 125 to 130 seats. He claimed that there is a strong wave in BJP's favour. "I have been in Karnataka politics for long... I will give it in writing. BJP is winning with an absolute majority the Karnataka elections. You can verify it once the results are out," he told reporters here. The Congress party is reached out to the Janata Dal (Secular) to help form the government in Karnataka, in an event of a hung assembly, sources have told CNN News18. The report has also suggested that JD(S)’s HD Kumaraswamy has flown to Singapore and has been negotiating from there. CM Siddaramaiah had on Sunday said he is open to making way for a Dalit chief minister if the Congress High Command decides so. To a question on the possibility of a Dalit chief minister, he said, "It is fine if the party decides to have a Dalit chief minister." Siddaramaiah's statement was seen as a hint that the Congress was seeking an alliance with the HD Deve Gowda-led party, with exit polls predicting a hung House where the JD(S) would emerge as the kingmaker. Chief Minister Siddaramaiah on Sunday said he is open to making way for a Dalit chief minister if the Congress High Command decides so. Siddaramaiah's statement came as speculation mounted over post-poll scenarios, with exit polls predicting a hung House where the JD(S) would emerge as the kingmaker. Setting a record,72.13 percent of Karnataka's over 4.97 crore voters exercised their franchise in the assembly polls yesterday, the state Chief Electoral Officer Sanjeev Kumar said Sunday, as he gave the revised figure of the voter turnout, according to a report by PTI. Election officials had said yesterday that an estimated 70 percent of the electors had cast their votes. Kumar said the voter percentage was the highest since the 1952 assembly polls. Bengaluru’s voting population is being ridiculed by the entire Karnataka for the low voter turnout of less than 50 percent as compared to the state average of 71 percent. Is urban apathy the only reason for poor show or is there more to it than meets the eye? While urbanites are usually accused of being lackadaisical, studies show that the turnout in Bengaluru is not actually low but appears to be so due to the bloated voters list. Much before the elections, Citizen Matters, an NGO, had predicted the city would record a poor turnout due to faulty electoral rolls. Making sense of the exit polls is impossible as each of them is way off the mark from the other. The only common factor is that former prime minister HD Deve Gowda’s Janata Dal (Secular) may emerge as kingmaker. A comparative study of various polls shows that there is no consensus running through them, except that no party will get a majority of its own. Some surveys say the ruling Congress will emerge as the single largest party, while others bet on the BJP. Uttar Pradesh Chief Minister Yogi Adityanath today accused the Congress of misusing its powers in Karnataka and exuded confidence that the BJP would form government in the southern state with a clear majority. "I'm the BJP candidate from BTM constituency. When I was visiting booths today, I was surprised to see people with lots of ID cards. They were ticking, calling people and giving them IDs asking them to vote. Later, the IDs were again given back there," claimed G Lallesh Reddy. He added, "I entered there and questioned but no one supported me. A man was making a video of it when his mobile was snatched away. Several Congress people threatened to kill us. I told concerned officers, they assured action but nothing has happened yet. We'll inform the Election Commission." BJP's CM candidate and Lingayat leader BS Yeddyurappa has said the saffron party will win 150 seats. Meanwhile, JD(S) has reposed confidence in their party winning in at least 90 seats. Leader of Opposition in Rajya Sabha and Congress leader Ghulam Nabi Azad said, "We will win Karnataka. In fact, we will win three more states in the North in the upcoming months." BJP chief ministerial candidate BS Yeddyurappa also tweeted his gratitude. He said, "Thank you Karnataka! Gratitude to the people of Karnataka for voting in large numbers today. @BJP4Karnataka is headed towards a landslide victory with all your blessings and support!" We have fought this election on the plank of our 5 year performance, and our vision for the state.